Radical and virulently anti-American Shi'a cleric Muqtada al-Sadr retuned to Iraq after a three-year stay in Iran. Ostensibly, al-Sadr was in Qom, Iran to continue his Islamic studies and attain the title of ayatollah; he had been a hawjat al-islam prior. His return to the Shi'a holy city of al-Najaf, site of the martyrdom of the first Shi'a imam 'Ali (son in law and cousin of the prophet Muhammad), was greeted with almost uncontrollable revelry in the streets. This is a bad omen. It was not unexpected, in fact, many of us Iraq analysts had predicted it. I have said that at some point in the not too distant future, Muqtada al-Sadr will emerge as the key power broker in Iraqi politics. That time may be drawing nigh. Why is this 37-year old such an influential figure? Muqtada al-Sadr is a sayid. Sayid is the Arabic word for mister, or sir. In Shi'a Islam, it also denotes a person who is a direct descendant of the prophet Muhammad through his daughter Fatimah and cousin 'Ali. It entitles him to wear the black turban. The Shi'a believe that leadership of the faithful should have been via the prophet's bloodline, and al-Sadr clearly qualifies. His family lineage is traceable back to the sixth iman, Ja'afar al-Sadiq, and the seventh imam, Musa al-Khadhim. The shrine of the seventh imam is located in the northwest section of Baghdad, appropriately named al-Khadhimiyah*. While Westerners sometimes dismiss the cache of the credibility of this direct lineage, Iraqis do not. 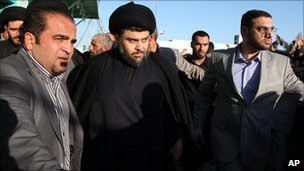 Al-Sadr left Iraq in 2007 as the American troop surge was beginning, ostensibly to enter into advanced religious training in Iran. While he did in fact enroll in studies in Qom, I suspect the reason for his departure was the fact that tens of thousands of American combat troops were headed for Iraq and would have taken on and destroyed what was left of his militia, the jaysh al-mahdi (Army of the Mahdi, or JAM). Regardless of al-Sadr's qualifications or alleged integrity, his is politically astute. 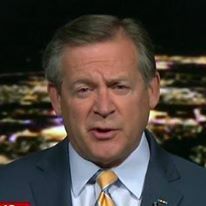 He realized that President George Bush was serious about ending the internecine violence in Iraq and had deployed enough troops to stop it. The new forces were not support troops, but trained and experienced combat units that were capable of taking the fight to the enemy, be it against the al-Qa'idah in Iraq (AQI) elements in the "Sunni triangle" northwest of Baghdad, or Iranian-sponsored Shi'a militias like the JAM in Baghdad and to the south. In al-Anbar governorate, the Sunni tribal leaders had become disenchanted with the rigid and arrogant foreign AQI leadership and decided to ally with the Americans, allowing the shaykhs to retain control of their traditional tribal areas. While generally religious, these shaykhs were not fanatics like the AQI youth from outside the country. The shaykhs were not in favor of a new social order, preferring life as it was before the war. The best way to attain that was to ally with the Americans and expel the AQI. The "Anbar Awakening" was not lost on al-Sadr. With the Sunnis making their peace with the Americans, and thousands of American combat troops arriving in the country, the focus was sure to turn to the JAM and one Muqtada al-Sadr. Rather than have his followers decimated by the better trained and equipped Americans, he ordered his militia to stand down. He himself departed for Iran to pursue religious studies. In other words, he ran. However, as I said, al-Sadr well understands Iraqi politics, particularly Iraqi Shi'a politics. When you say "Shi'a politics," you also have to consider Iran and its influence on Iraq's Shi'a majority. Despite the 1980-1988 bloody war between Iraq and Iran, most Shi'a on both sides of the border view that conflict as a war triggered by the Sunni Ba'thist regime of Saddam Husayn, and not a war between Shi'a brethren. The Shi'a bond is strong, as evidenced by the close relations between the Iranians and Iraqi Prime Minister Nuri al-Maliki, senior Iraqi cleric Grand Ayatollah 'Ali al-Saystani and of course, Muqtada al-Sadr. Despite the close relationship between the Iranians and the Iraqi Shi'a, the Iraqi Shi'a have differences as well. How they resolve these differences may well determine the future of the country. After all, it was Prime Minister al-Maliki's troops that effectively eliminated the JAM as a fighting force during internal struggles in 2008. There has always been tension between the non-violent al-Saystani and the confrontational al-Sadr. In the recent maneuverings to form an Iraqi government, al-Sadr joined a coalition with al-Maliki and the Kurds against a secular group that actually won more seats in the election. Without al-Sadr's support, it is almost certain that al-Maliki would have been forced from office; he is beholden to al-Sadr for his position. Both al-Maliki and al-Sadr have close relations with Iran. It would appear that the key power brokers in Iraq are now Iran and Muqtada al-Sadr. Not bad for someone who turned tail and ran and whose militia was decimated by his current ally. As the United States prepares to withdraw all of its forces, against my advice, who will emerge as the most powerful man in Iraq? I say Muqtada al-Sadr. It did not have to be this way; I advocated killing him in 2003 when we had the chance. * In 1987 and 1988, I worked out of an office in the headquarters of the Iraqi Directorate of Military Intelligence (DMI) located in al-Khadimiyah less than a mile from the Musa al-Khadhim shrine. In 2006, Saddam Husayn was executed at that same DMI facility.